You can put the trade rumors to bed. 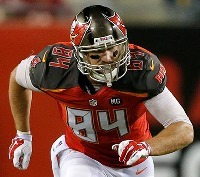 There is a trade rumor circulating among NFL social media that the Bucs were open to hearing offers for tight end Cam Brate. Let’s just say that rumor is now known to be pretty bogus. Per Jenna Laine of ESPN, Brate recently had hip surgery. Simply put, no team is going to trade for any tight end just coming off hip surgery. Late last year, then-Bucs coach Dirk Koetter stated Brate was playing banged up “from Day 1.” When Joe asked Koetter about Brate’s injury and potential need for surgery, Koetter wouldn’t comment. Per Laine, Brate had a torn labrum in his hip. Brate underwent arthroscopic surgery last week to repair the injury, which included the removal of bone fragments. He is currently on crutches. Recovery time will be a “few months,” the source said. The expectation is that the Bucs will ease Brate back into action during OTAs with the hope of participation in the June minicamp. Now Bucs fans have something else to be concerned about. 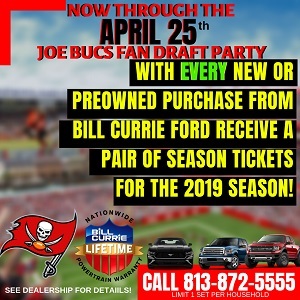 Joe thought this trade rumor about Brate was silly simply because not only does new Bucs coach Bucco Bruce Arians like to use two tight ends, stud tight end O.J. Howard has finished both of his NFL seasons on the injured reserve list. Thus far, Howard hasn’t proven he can stay healthy for a full season. Now with Brate’s 2019 season uncertain, all of a sudden tight end is not the loaded position we thought it to be. Unfortunately I remember the errant pass that saw him leave the field for the rest of the season. Let’s just say “hung out to dry” sums it up. So this should answer those questions as to why the speedy but diminutive DJax was so apprehensive about risking severe injury on poorly thrown passes. …and to why Howard can’t stay healthy too. What pass was that? Please share with us. Smug and full of it. This is football. IDC who gets hit or gets hurt. It’s what they signed up for. It’s part of the game. You wanna soft team??? Go root for golf. Can’t believe that your saying the JW is responsible for injuries 😂😂😂??? Howard was injured getting tackled from behind. Save us the time if you already know, which pass was it? “Koetter stated Brate was playing banged up from Day 1.” Jameis was suspended until week 3, did Fitz hang him out to dry? I see jean is up late waiting for his wife to get home from the bars with his replacement. The pass that saw Brate leave the field was late in the New Orleans game on a high throw that Brate climbed the ladder and was pin balled in midair on the hip region. He left the field on his own for the final time. It was another classic overthrown ball by JW. Jean, you are an idiot. Joe why do people who blatantly lies or make things up have a source to spread their BS? An opinion is one thing no matter how dumb it is but complete disregard for facts is another. @Jenna Laine … “He (Brate) is currently on crutches. Recovery time will be a “few months,” the source said.” Bad news like this is why I’m at best ‘cautiously optimistic’ about the Bucs. The ‘optimistic’ part comes because we have two outstanding TEs. The ‘cautiously’ part evolves from the fact that BOTH of them finished the season badly banged up. Some injuries guys can come usually come back from 100% … injuries like ankles (Beckwith), hips (Brate) & yes, severe concussions (Unrein) are much more concerning IMO. o Mitch Unrein … Missed all of the season & most of training camp. o Vita Vea … Missed the first 3 games & almost all of training camp. o VHIII … Injured in Game 1 & missed rest of season. o Beau Allen … Missed first 2 games. o Brent Grimes … Missed first 2 games. o Chris Conte … Injured in Game 3 & missed rest of season. o Vinny Curry … Injured in Game 6 & missed 4 games in middle of season. o Kwon Alexander … injured in Game 6 & missed rest of season. o Justin Evans … re-injured in Game 12 & missed rest of season. Numerous other defensive players missed various games & relatively few would be considered ‘Ironmen’ on the Bucs (JPP certainly wins that award IMO, although several others like Will Gholston, Cam Lynch & Ryan Smith did suit up for 16 games on defense). Numerous Bucs got in 16 games on offense & special teams, but not so for the defense. Funny thing is that if you go back to our 2002 Super Bowl year almost all of our starters & key rotational guys on defense were available for 16 games. Whereas in 2018 the ONLY starter who started all 16 games was JPP, in 2002 we had EIGHT starting defenders who started ALL 16 regular season games. Amazing what can happen when a team stays healthy for a whole season. The reason why all our defenders were injured was because Jameis was firing misguided passes at them in practice. Thanks Jameis way to ruin our whole team. One of more than a few times Brate was absolutely obliterated at either the goal line or in the end zone. Except for the concussion protocol issue, some of those injuries are most likely caused by the player’s not having that “want to”. Now JPP on the other hand (no pun intended) seemed to play thru some injuries at a pretty effective level without whining about it. Could have been worse news. He’ll be out some time, but he’ll return by next season. His 2019 season is not in question at all, as was inferred. Any news on who the Bucs strength, conditioning AND diet team will be consisting of? Of course the REAL Buc’s ironman is Donovan who everybody wants to run off. Again…the old saying…the best ability is availability. Brate is the smartest player on the team unless it’s Fitz. He will handle this very well. He really doesn’t need OTA’s or June…if he’s healthy by August he’ll be ok. Also his game is catching the ball in a crowd…frequently in the end zone where DB’s like to crush receivers. It’s simply one of the more dangerous jobs in the NFL perhaps behind RB…in some ways worse thought because the RB frequently is delivering the blow…Brate was focused on the football a lot. And so a question for Jean or anybody else who wishes to blame this on JW. If JW has a choice…throw a pass that NO defender can pick but exposes his target to a large hit…should he throw the ball or eat it to “protect” his target? It’s simply NOT touch football out there. Reread D.R.’s post. I remember the throw you’re talking about, it was heinous. I don’t know why JW loyalists refuse to accept that he has a BIG problem with accuracy. Cops do not have the skill set nor do they have ability to generate revenue like elite athletes. Pretty poor comparison. Plus you add in benefits all the overtime etc cops make a good living. Good point and I agree. Cops LITERALLY put their lives on the line for us every day they show up for work. NFL players…not so much. But it’s even worse than you think. Average salary for police officers and sheriffs is 60,000 for NFL players 2.1 MILLION. That means cops earn about 3% of what average NFL players make. Of course Brate is no longer considered average and he made SEVEN MILLION for putting that hip on the line. BTW as the blog optimist I feel obliged to point out the good part of this story. He underwent arthroscopic surgery which is a lot less invasive than cutting him open and doesn’t mean cutting through any muscle. Perhaps Tickdr is around this morning. As an actual physician perhaps he can share what arthroscopic surgery means. Was the injury less severe that they could do arthroscopy? Might as well ask someone who knows instead of me! Clueless Jean blames every injury on America’s Quarterback. Must be a Gator or white supremacist. You do know we play Atlanta twice a year and the second meeting was week 16 or 17 right? I am sure Dirk said that Brate has been injured “all year.” Now looking back at the 1st half of the year it makes sense we did not see much of Brate until O.J. was hurt. Only talk in the first half of the season was how many thought Brate was being phased out of the offense in favor of Howard. If someone is looking for things to blame on a player they dislike it all makes sense now. i want to be clear dude i was not disrespecting cops just pointing out that millions of people do not pay to watch a cop baker act Bonzi for delusional assumptions. millions of people do pay to watch elite athletes. I am an A-Hole for sure but wanted to clarify that one. According to Koetter Brate played through this injury all year…he didn’t get it at the end of the season. If it was N.O. that would be the first game of the year. LaRue you do realize koetter said brate was playing hurt since day 1, right? Who did we play in week 1? And no, I didn’t know we play division opponents twice every regular season. Thanks for the update. I guess ol Jean must’ve been talking about week 14 against the saints and week 17 against the falcons. Wait, LaRue, is the saints in our division? I see we played them twice this year 😮 mind blown! Another great move by Dirk to let Brate play banged up from day one when he was having an obviously sh!tty year. They obviously knew he was going to need surgery soon after the season and yet didn’t put him on IR and let him play out the rest of the year. I didn’t say Brate wasn’t playing hurt all year. I was talking about the hit he received in the 4th quarter of the Atlanta game and never returned. I will say we lost Kwon for the year the play after a Jameis pick. Someone called him out in locker room and that was the fight you heard about post game. Well if there is one sport where I think the players earn every dime they make it is football. Injuries are a huge part of the game and the majority of them will have brain issues later in life due to the head trauma. I love what cops due and respect the job and the dangers they face, but it’s not like football players are not risking a hell of lot every time they go on the field. Got to give Brate credit to tough it out for the whole season with a torn labrum. I wish there were more bucs like him. (acetabular labrum). Labrum means lip, so the cartilage ring is thicker at the edges to help hold the femoral head (the ball) in the acetabulum (the socket). So, a torn labrum is a torn cartilage which can cause pain, or “lock up” the joint, if the cartilage is trapped in the joint space. Arthroscopic surgery( put in a scope under anesthesia, which allows the torn cartilage to be trimmed away, and loose bodies to be sucked up) is usually done, as the treatment does not typically require opening up the entire joint.